I know this won’t interest everyone (my husband included!). But there’s something about baby names that has always fascinated me. Our local paper publishes the full names of all the babies born each week along with a few photos. I’ve been copying down the ones that caught my attention for the last few months, and I’ve begun to observe a few trends. International names: (we’re definitely part of a much more international community than the one in which we used to live). And a caveat — I’m just using my instinct and judgment in categorizing these. I am in no way trying to offend cultural groups and any errors are simply due to my personal lack of knowledge. Anyone having a baby and looking for a unique name? There are quite a few options in my small Bavarian town. 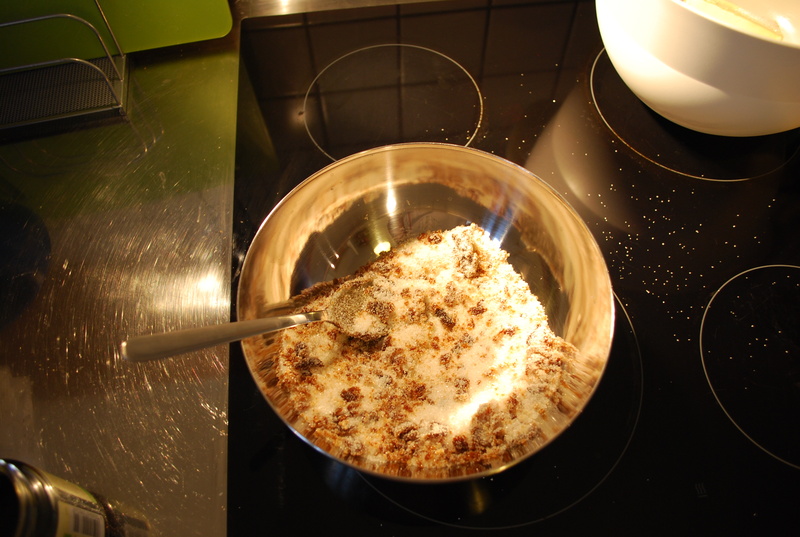 When I found out I’d be a stay-at-home mom here in Germany, I imagined myself having time to do more baking. Homemade muffins and healthy after-school snacks? Sure, you bet! The reality turned out to be quite different. We’re much busier than I thought we’d be with just the basic cooking, cleaning, errands, and childcare. I have so far managed to make one batch of muffins (so-so) and one apple cake (tasty but not the right texture). 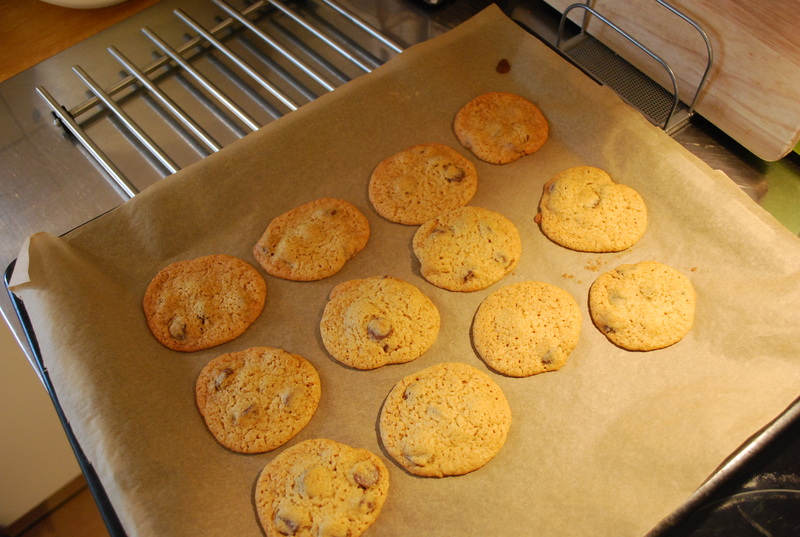 Today, I attempted some American-style chewy chocolate chip cookies. First baking conundrum: the flour. 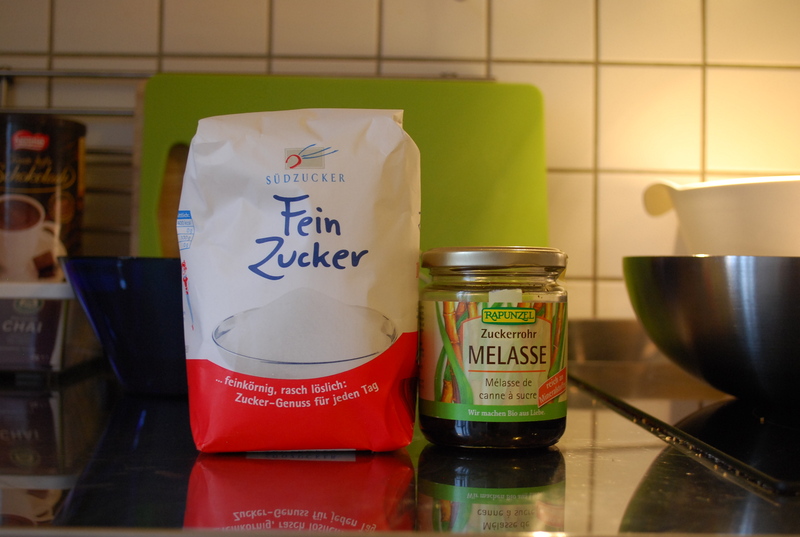 German flour is labelled by the grain used (spelt and rye flours are more readily available) and by how finely ground and refined it is. #1600 flour is whole grain, and the lower the number the less of the bran remains. Some internet searching helped me to understand that the most commonly used flour (labelled as #450) is similar to American cake flour. The flour I used was #550. Also, you must sift the heck out of it. 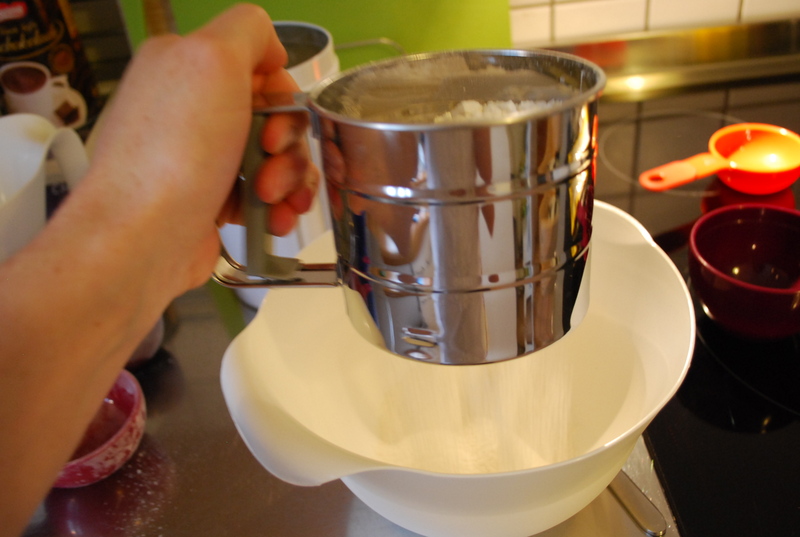 I sifted once before measuring, and once after. 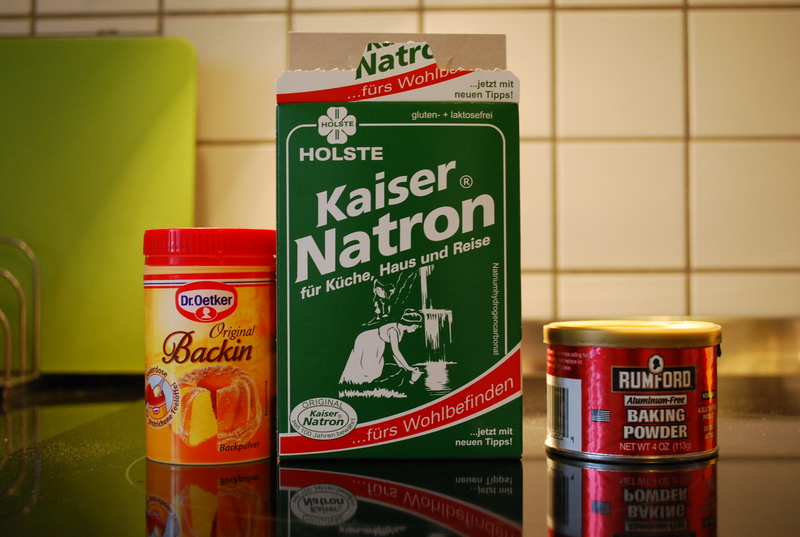 German baking powder (on the left) is single-acting, rather than double-acting like we have in America. Thanks to Mom’s visit, I have a can of American double-acting baking powder as well. But my cookie recipe asks for baking soda. Arm & Hammer uses 100% sodium bicarbonate. 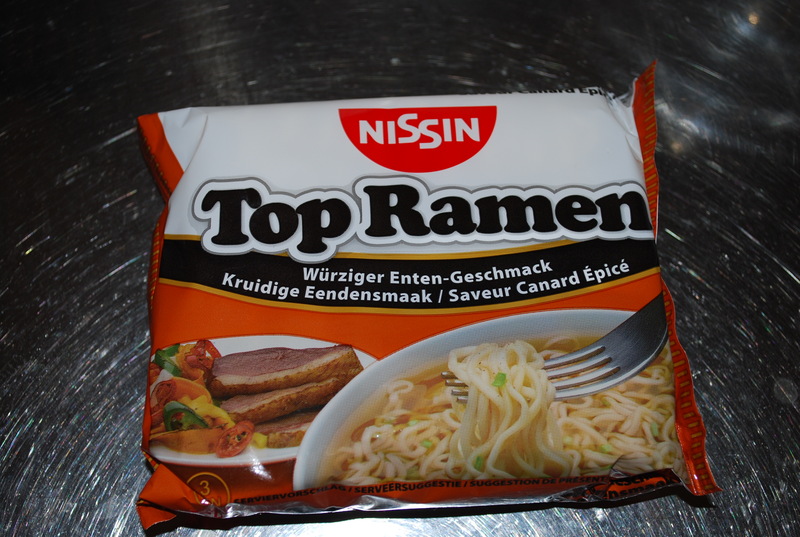 That’s not available in Germany, but we do have a similar product called Natron. It’s only 17% pure baking soda, but apparently can be subsituted for many of baking soda’s purposes. We’ll see how it turns out. Then comes the math. I had to pull out my calculator to figure out how much 1 cup of butter equals in grams (it’s 227, by the way). German butter comes in 250g rectangles, so I did my best guess to measure the right amount. Also, salted butter is rare in Germany. 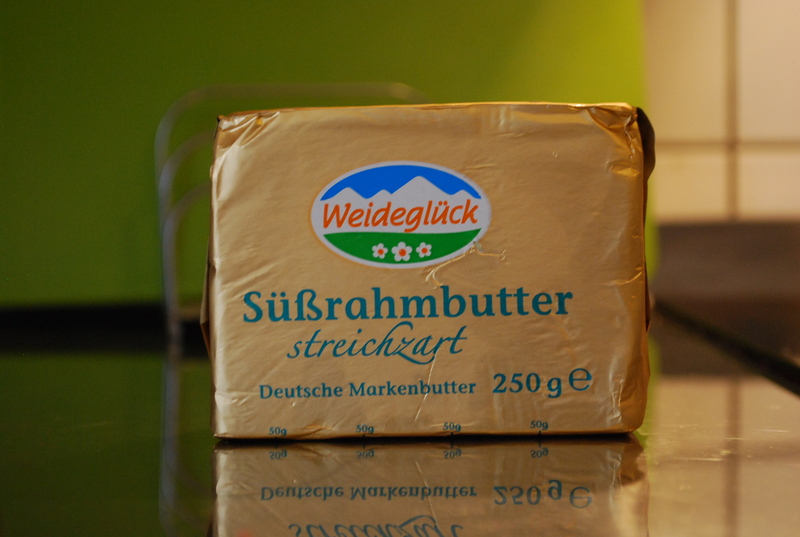 They categorize the butter as Süßrahmbutter (literally “sweet cream butter”) or Mildgesäuerte Butter (cultured, slightly tangy butter). I use the sweet cream one for baking. Granulated white sugar is called Fein Zucker here. I had heard that brown sugar wasn’t available, but when I saw this package, I took a chance and bought some. Looks promising, right? The contents weren’t the moist, caramelly-flavor that I was hoping for however. 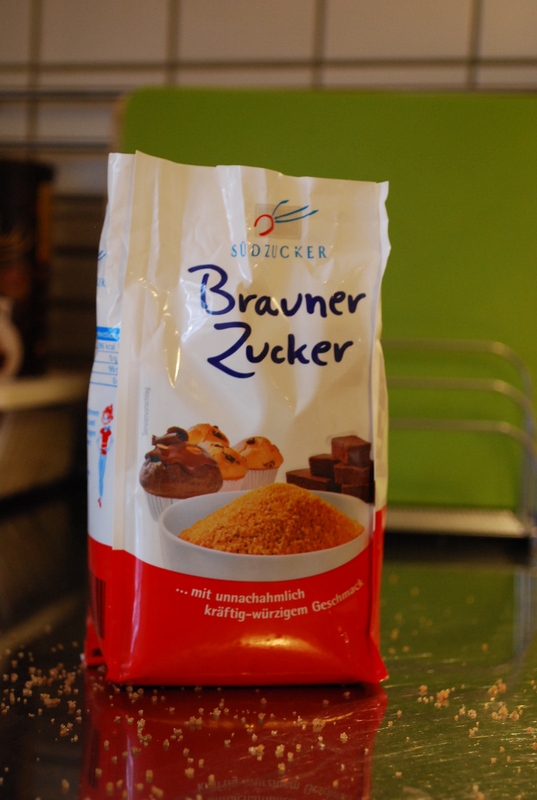 Seems like Brauner Zucker is a bit more like a dark version of Demerara or raw sugar. White sugar and molasses. Who knew? Well, probably many people, but I sure never knew before. 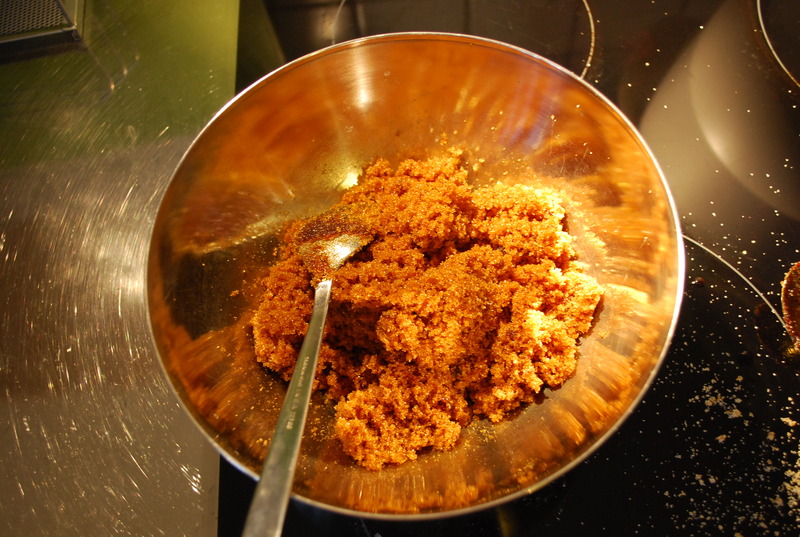 Dollop some of the molasses onto the white sugar and then stir to blend. 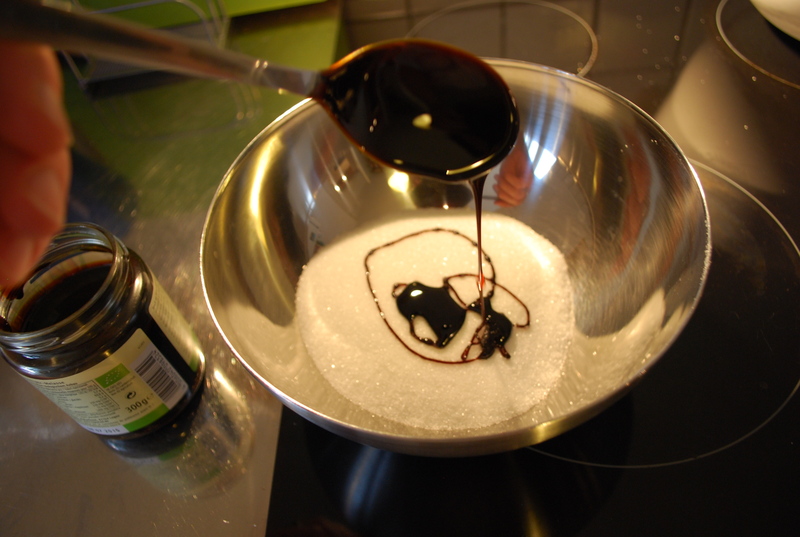 It seems like about 1 tablespoon for every 1/2 cup of sugar is about right, but it’s pretty easy to add a little more molasses or sugar if it seems to be either too light or dark. At first it seems like it’ll never come together, but just keep mixing. Ta da! Pretty good substitute for dark brown sugar. 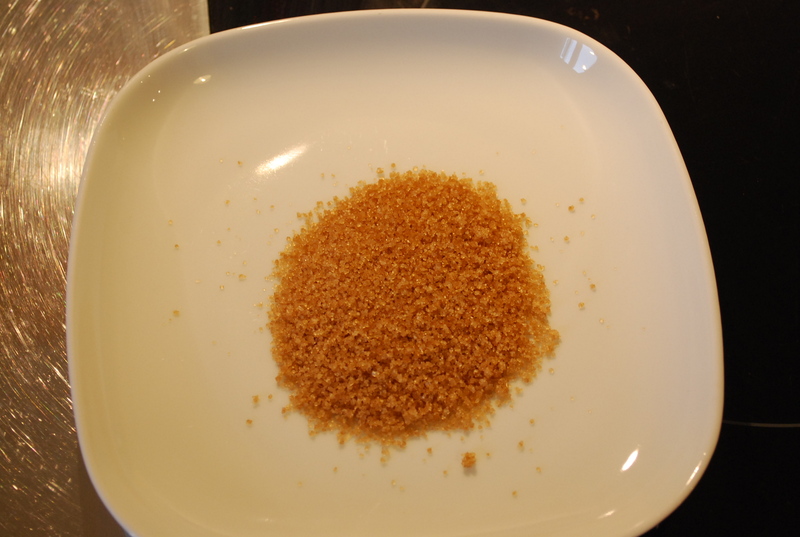 I’m not sure how to make light brown sugar, however. Maybe substitute some agave syrup or honey along with the molasses. Anyone know the answer to this one? 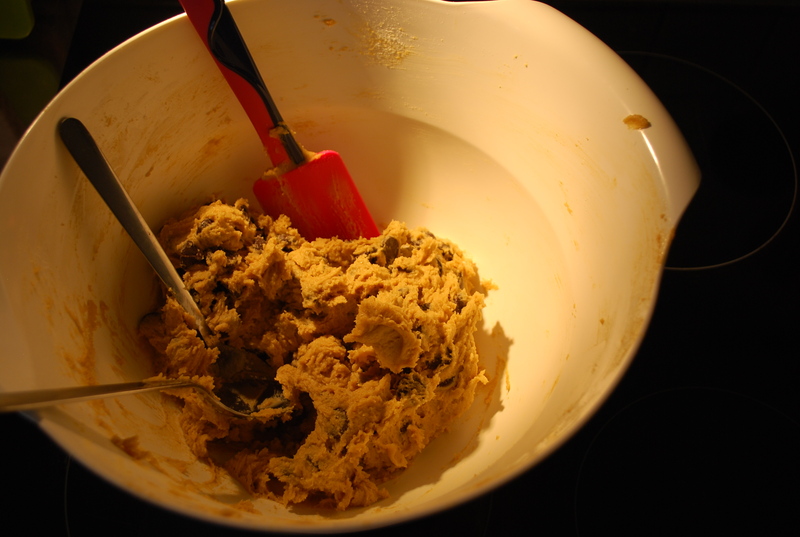 I’d love some baking help in the comments. 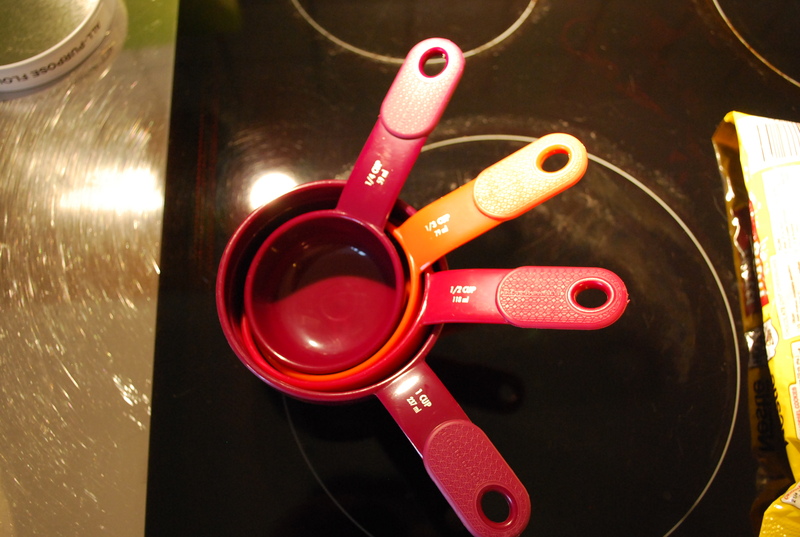 Luckily I was smart and packed some Imperial measuring cups and spoons in my suitcase. I don’t want to have to buy a kitchen scale or convert everything to mL and grams. 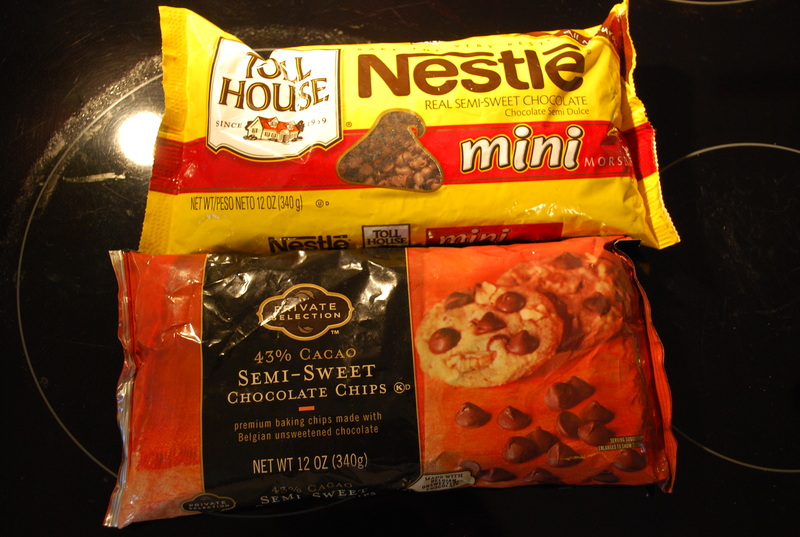 And Mom brought me some American chocolate chips in her suitcase. Thanks, Mom! One box costs €2, and holds very little. The container at right is filled with 3 boxes. They have a very mild milk chocolate flavor. 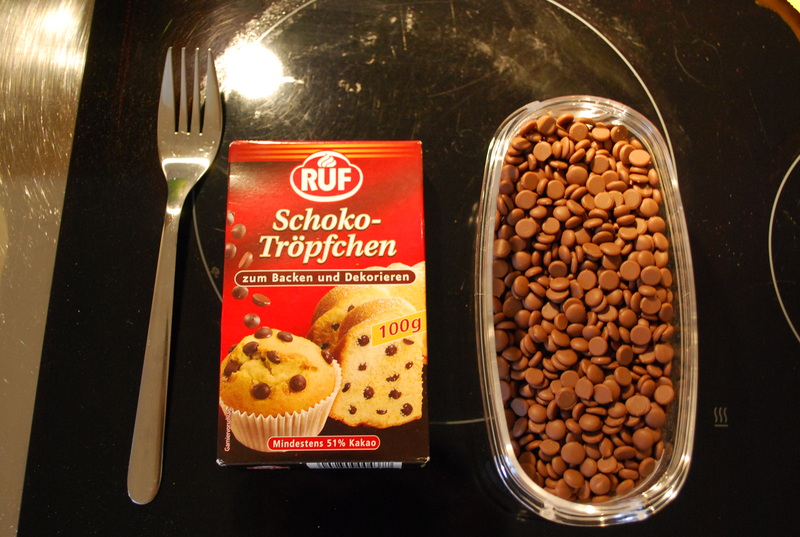 When I tried to put some in my muffins, we could hardly taste them. Some expat blogs recommend buying a better quality chocolate bar and chopping it yourself, but thanks to Mom’s care package, I didn’t have to try that this time. 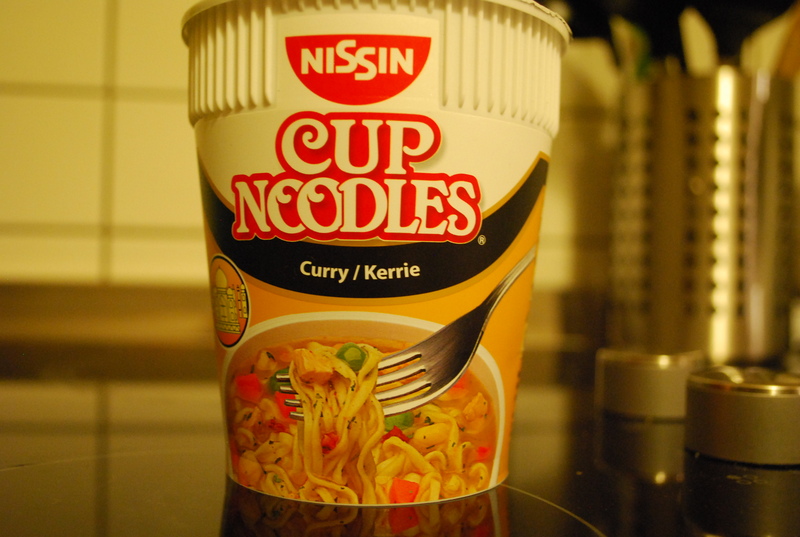 It’s nice to have a taste of home, sometimes.